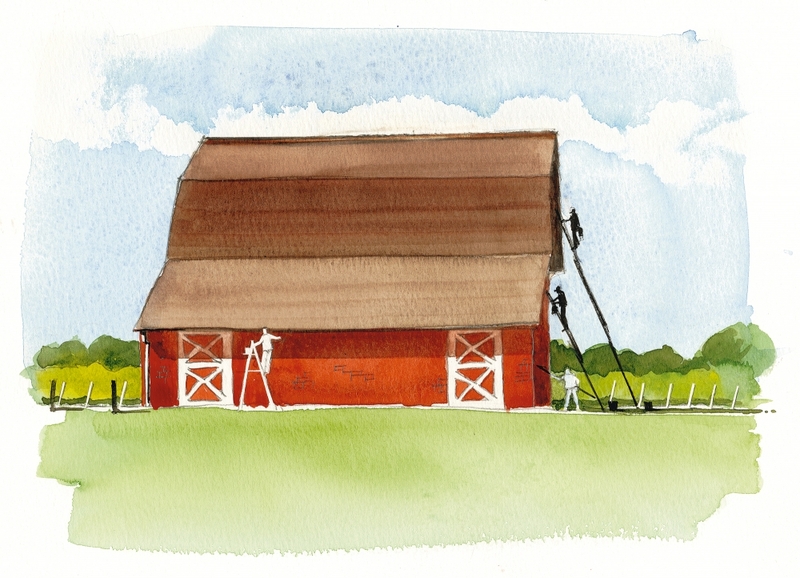 The first time Bob Miller picked up a paint brush was to do a landscape on the side of an old wooden peach crate he found behind his father's barn. Growing up on his dad's peach farm in the 1930s east of Modesto, California, he was raised with a traditional American work ethic and an affection for small town life. As he tells it, fond memories of his early years there is why he fell in love with the North Fork of Long Island 60 years later. In the mid-80s Bob was part of a group that called themselves 'The Painter's Dozen'. Fellow watercolorists that met every third Saturday of the month. It was there that he discovered the world of painting 'en Plein Air' (in the open air) where his fascination for painting local hangouts, wineries and rural landscapes really blossomed. It may have been an Indian summer, he's not really sure. He recalls an unusually warm fall in 1996, with pumpkins still scattered in the fields. Bob, along with his wife, Anita and his middle son, Dan, were driving up to the North Fork for the first time. Little did they know the impact that first impression would make on their lives until years later. Dan fell in love with the area and ended up buying a farmhouse there. More than just a great excuse to visit his son, this gave Bob a home base from which he could explore the area and paint outside in the brisk autumn air and warm North Fork light. Of the 150 watercolors that Bob has made of the surrounding villages, farms and vineyards, most were painted during the many return visits over the years. Seeing the big trees by the barn on his son's two acres reminds him of his early days back in Modesto. "It's a farm the way you'd dream a farm would be." Approximately eighty miles east of Manhattan between Peconic Bay and the Long Island Sound are eleven small towns that comprise the North Fork. Aquebogue, Jamesport, Laurel, Mattituck, New Suffolk, Cutchogue, Peconic, Southold, Greenport, East Marion and Orient. Surrounded by family owned farms that have been there for generations, they remain simple pastoral communities unaffected by urban sprawl. No shopping malls, no billboards or abandoned storefronts. Like pearls strung along the shores of Walt Whitman's beloved Peconic Bay, the villages of the North Fork have managed to retain their rural character for nearly four centuries.